Our American Flags are only made in the United States of America, the only place our Nation’s flag should be made! At Star Spangled Flags, all flags are crafted using high quality nylon or polyester and treated to prevent pre-mature fading. Every flag comes with a certification label as proof. View cart “Nylon Printed American Flag” has been added to your cart. Be a proud owner of our Poly-Max™ American flag that’s designed to fly in high wind conditions. Identical to our Nylon Embroidered Flag but banner style with pole sleeve and leather tab instead of grommets. We use only the hardiest thread, so the stars are bright, white, strong and beautiful. You will notice we use lock stitching to prevent unraveling, so your flags’ stitching will hold much longer than other flags that use only chain stitching. We also offer cotton flags for your indoor flag needs. We are often asked the question: should I purchase a nylon, polyester, or cotton flag? Our answer is: that depends on where and how you will use your flag. Nylon is by far the most favored flag material due to the fact that our nylon flags fly beautifully even in a very light breeze. Our polyester flags are heavier than our nylon flags and are crafted from strong 2-ply polyester material. These flags are created to hold up in locations where the flag will endure high winds much of the time. Therefore, since the flag is heavier, it will not fly easily in light breezes. A cotton flag is most often used indoors as a banner or sometimes used to drape over a casket. You will often see a cotton flag inside government buildings, in courtrooms and churches. You may use a cotton flag outside, but it is only intended for very short-term use. Since a cotton flag is heavier, when it becomes wet, the lifespan of the flag will be shortened, and it will put a burden on the flagpole and any flag attachments. All our American flags at Star Spangled Flags are started and finished onsite to assure government and military standards are satisfied. 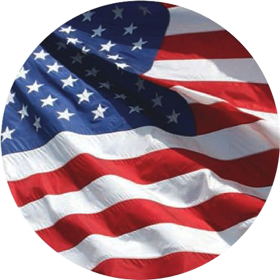 Our flag manufacturing procedures guarantees we provide you with unmatchable quality and value when searching for the highest standard in your own American Flag. If we may ever be of assistance, please choose [CONTACT] at the bottom of any page. You may send an email or give us a call and we will assist you as soon as possible.